Shaikh Abdol-Hamid pointed out to changes in the global circumstances in all fields and urged on reviewing and changing internal and foreign policies of the country. He termed changing the policies a need of time and Iranian nation’s demand. “Insisting on the strategies and policies of 10 or 20 years ago is incorrect. The Islamic Republic of Iran can advance and get achievements in the world to move in accordance with the global conditions. It is in favor of Iranian nation and state to reorganize policies and strategies according to the new conditions of the world,” he underlined. “It is regrettable that the current constitution is partly-implemented and in many cases personal views sideline the laws. Some offices and bureaus consider themselves legitimate to violate law and put the constitution under their feet,” he further said. “Unfortunately, here in our own country we also face ethnic and religious fanaticism which is an obstacle in the development of the Iranian nation. Iran and Iranian nation deserve a higher position, but these bigotries have stopped us,” he added more. “People should enjoy their legal rights. In this country no one is authorized to bar people from offering prayers. Preventing worshipers from offering Salah/prayers is against Islam. We are not Takfiri to issue verdict and call anyone disbeliever, but we are suspicious about Islam and faith of those who forbid from prayers. 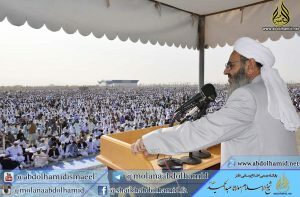 There should not be any fear about offering prayers,” he added more. “At least we should have the liberties mentioned clearly in the constitution and Islamic laws. We should provide people their due rights which were given to people by the prophet Mohammad, peace be upon him, and Sayyidana Ali and other guided caliphs, may Allah be pleased with them,” he added more. “Narrow-mindness has been a challenge in the country and the officials should discharge such individuals,” he underlined. Member of the MWL strongly criticized the passive behavior of authorities about the letter and order of the Supreme Leader regarding Sunnis’ rights and problems. “Why has the order of the Supreme Leader as the first man of the country not been implemented? However some elements consider it an interim stance, but it is an actual order and the National Security Council should circulate it to all offices,” Mawlana Abdol-Hamid said. He said there should not be any difference between Shia and Sunni in the country and particular problems of the Sunni community should be resolved. “This is the time that higher officials should give Sunnis their due rights after 40 years. Islamic Republic of Iran is about 40 years old and in this age people reach to intellectual maturity; this regime also should reach to maturity by reviewing its policies and strategies,” he added more. The top Hadith teacher of Darululoom Zahedan called on all Muslim rulers and leaders to take care of minorities’ rights. “I’d like to ask all Muslim rulers to take care of human rights and the rights of minorities in their countries. Islam urges human rights more than other religions,” he added more.